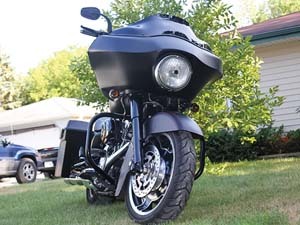 Give your Road Glide a Facelift! 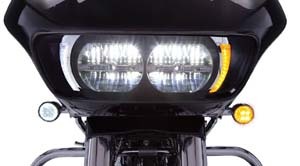 C3D-420: The Lighted Vent Trim features 30 super bright white LEDs in a low-profile chrome housing to really draw attention to the front of your Road Glide. The housing is a clean design that sits perfectly in the vent of your fairing, but will not affect the airflow. 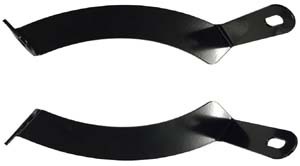 C3D-421: Similar to above but in black. 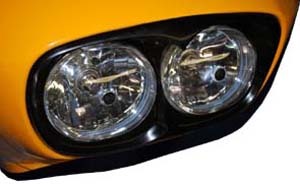 C3D-45: These Headlight Bezels replace the dull black plastic on both sides of your headlight with bright white LED running lights and amber turn signals set in a very clean housing. The bezel simply bolts to where you've removed the stock trim and plugs in with the included wiring harness for a quick and easy installation. Fits 2015+ Road Glides. 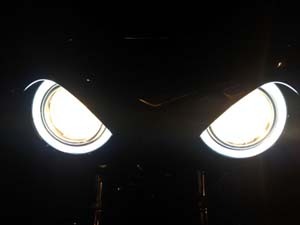 PRE-1,2,3 & PRE-Z: Designed to dramatically improve headlight performance compared to the stock system. We use only the best lighting products available from Hella and incorprate them into our striking designs. Installation is a snap, requiring only a few minutes of your time and basic hand tools. Easy 60 minute installation. Avaiable in Black, Show Chrome or Two Tone Black on top, Chrome of the bottom. 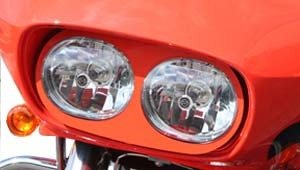 Two CCFL Halo Ring "Angel Eyes"
IB-CC: Give your Road Glide a facelift with our chrome-plated plastic bezel, clear lens and integrated LED run and turn signal. 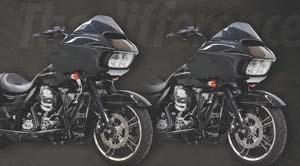 Fits '98 to '13 Road Glide Fairings. Easy installation. 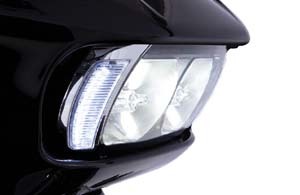 Note: If not using stock turn signals, you will need to purchase a load equalizer separately (IB-LE1 if equipped with a factory alarm, or IB-LE2 if without a factory alarm). IB-CS: Chrome bezel and smoked gray lens. IB-BC: Black bezel and clear lens. IB-BS: Black bezel and smoked gray lens. 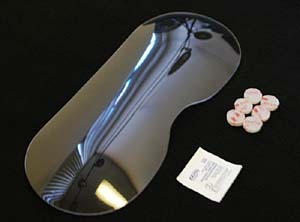 HF-TLC: Lightly tinted lens cover is a direct replacement for the clear lens cover found on 1998-2009 FLTR Road Glide. 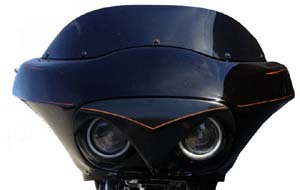 Will also fit 2010 to current Road Glide by removing the stock flat black headlight surround. Simple 5 minute installation. 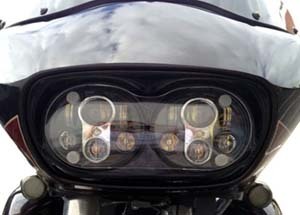 SHG-1B: New headlight guard for your Road Glide. 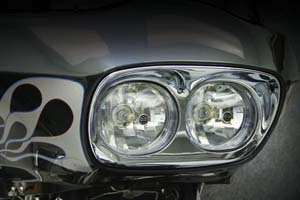 Heavy wire headlight guards look great and protect your head lights. The guards come in a durable black powdercoat finish for that stealth look. Special purchase item. 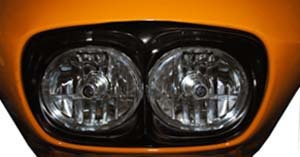 Fits up through model year 2013; however, model years 2009 and above require removal of headlight bezel. The SHG-1B will somewhat hide the fact the bezel has been removed. SGH-2B: Similar but in dual option. 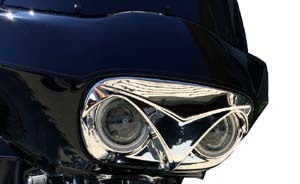 BAG-1: New headlight grill for your Road Glide. 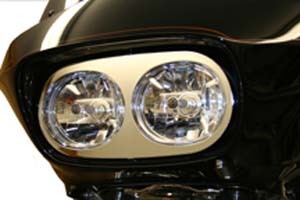 Polished billet aluminum grill protects your head light and offers an exotic custom look. 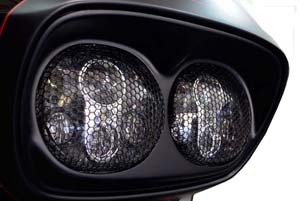 HD-412: Similar to above but in gloss black. HFP-PRR: Exclusive! 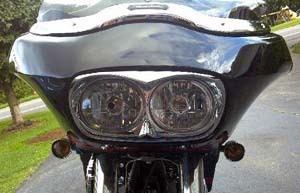 2015 Road Glide headlight trim in chrome. OE fit and finish for easy installation. Sold in two piece set (left and right) and instructions. 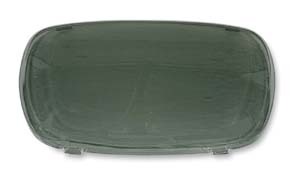 HFP-PCH: This item eliminates the need for the outer acrylic shield on all Road Glides. 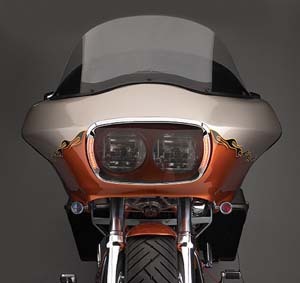 Beautiful chrome plated finish creates a nicely finished look to the front end of your Road Glide. 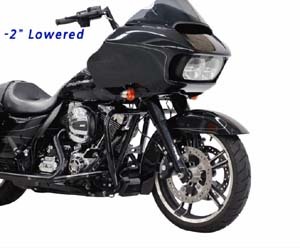 Fits all Harley Davidson FLTR Road Glide 1998-2011. HFP-GB: Same as above but in gloss black. HFP-PCH, HFP-CH, HFP-MO, HFP-CR: Add some classic style to the front end of your Road Glide with this beautiful Chrome Faceplate. 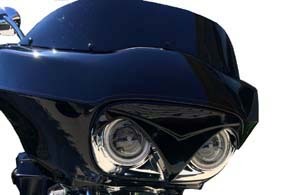 Inspired by the original Tour Glide front end. 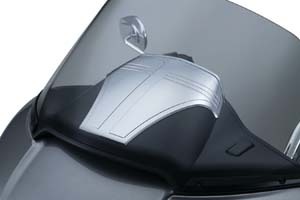 Fits all 1998-2009 FLTR Road Glide. Simple two minute installation. Shown without acrylic cover, but works with it or any aftermarket version. Made from chrome plated steel. 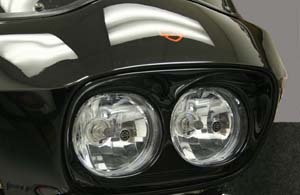 DB-101: Headlight Bezel will update your Road Glide in seconds! 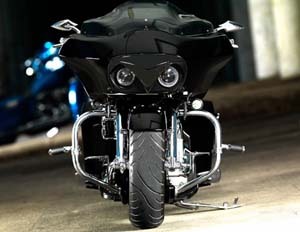 Gives your Road Glide a nasty aggressive look. Fits 1997 - 2013. New mounting design allows you to remove and assemble this bezel as many times as neccesary. You will not have the worry about the factory bezel with the tabs breaking. It is made of NYB polymer..which is stronger than ABS! NOTE: THIS BEZEL WILL NOT WORK WITH HARLEY'S NEW DAY MAKER LED's. 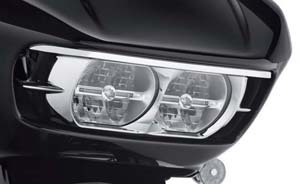 DB-057: Headlight bezel gives your Road Glide a nasty aggressive look. It fits 2010 to 2013 present models. This will replace the poor factory Harley design. There will be a slight trimming needed for the 2012 models. 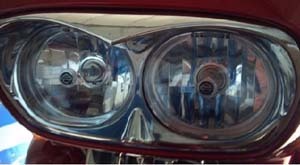 It will fit earlier years but you need to upgrade your headlight assembly first to 2009 or newer. This bezel is made of NYB polymer..which is stronger than ABS! 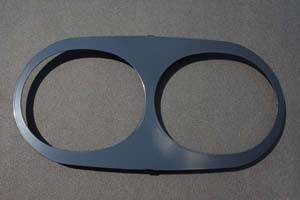 These bezels are designed for the 2010 to present assemblies. 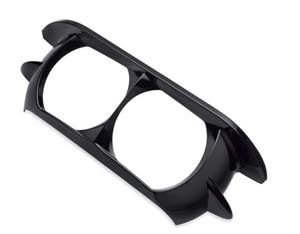 New mounting design allows you to remove and assemble this bezel as many times as neccesary. You wont have the worry of the factory bezel with the tabs breaking. NOTE: THIS BEZEL WILL NOT WORK WITH HARLEY'S NEW DAY MAKER LED's. 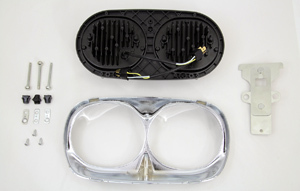 DB-054: First ever 2015+ headlight bezel!! 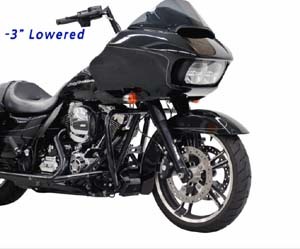 Gives your stock Road Glide the aggressive custom look in 5 minutes! All stock components function as normal and there no obstructions to the light, all air vents also function. 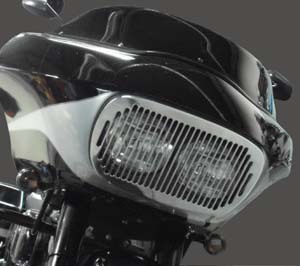 RG-BMC: Custom chrome finish headlight bezel. 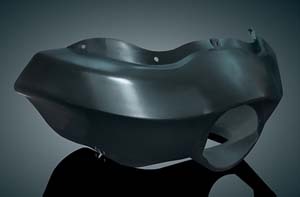 Injection mold ABS plastic for precise fitting and smooth finish. Direct replacement for stock bezel, no modification needed. 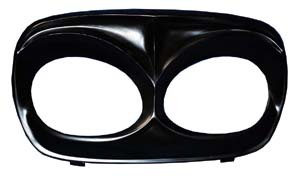 Fits: 1998-2013 Harley RoadGlide with factory fairing. RG-BMB: Same as above but in black. 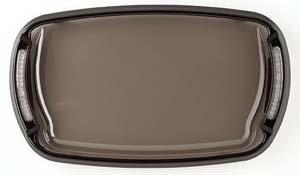 DA-62: Enhance your view by transforming the dull black inner fairing upper dash panel and vent into a whole new landscape with this Dash Accents. The contoured accent hugs the center of the upper dash and vent just behind the windscreen, featuring clean styling for a streamlined custom appearance. Measures 8" long x 11" wide, with hassle-free installation. Constructed from durable injection-molded ABS. 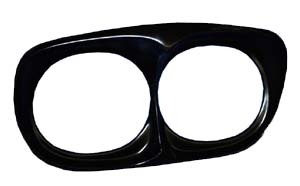 Perfect complementing piece for Stereo Trims for Road Glide parts all sold separately. Fits model year '15 to current Road Glides. DA-62: Similar to above but in gloss black. 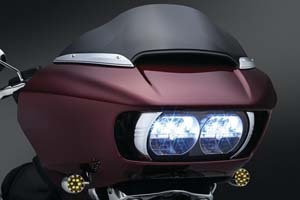 6925: Enhance the headlight assembly on redesigned Road Glide™ fairings with this easy-to-install ABS accent that carries a custom theme to the vent area. 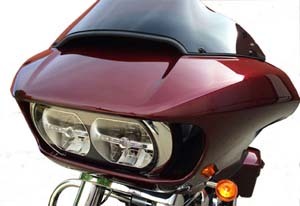 A simple peel-&-stick application using 3M VHB adhesive does not require or impede removal of the outer fairing. Fits: '15 Road Glides. 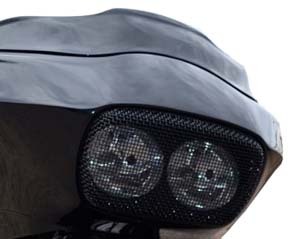 KVS-45: Accent the vent system in the new 2015+ Road Glide fairing design with these Fairing Vent Screens. 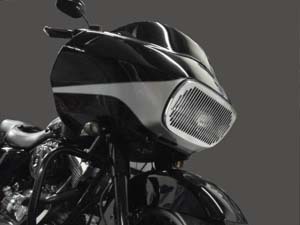 Fairing Vent Screens are easy to install, and the Honeycomb patterns adds a custom touch to the front of your fairing. 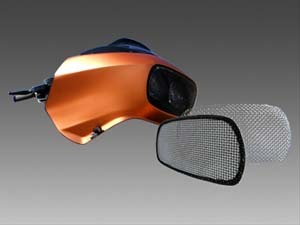 Vent screens may even catch or stop larger bugs and other road debris from entering through your fairing vent. Fits ALL 2015+ FLTR HD Models. 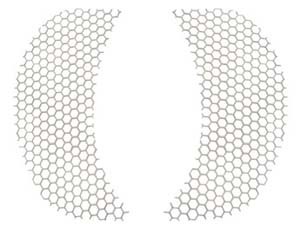 Available in Honeycomb pattern. Comes with industrial strength adhesive to hold vent in place. Made in the USA. 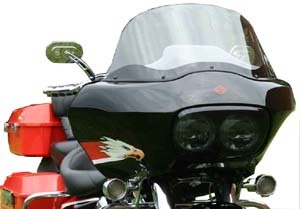 RF-86: Take your Road Glide to the next level with this custom replacement outer fairing. 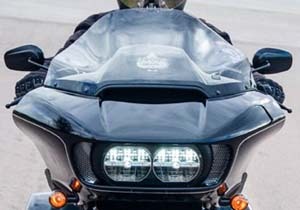 The fairing retains the aggressive shark-like profile of the stock fairing, but replaces the dual headlight configuration with a 7" round headlight from an Electra Glide or Street Glide. 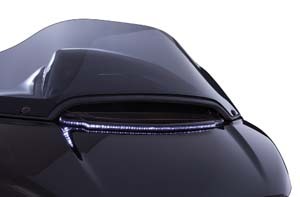 Besides the awesome custom look-it also provides the perfect way to upgrade the poor stock Road Glide lighting to the cutting edge performance of our Phase 7 L.E.D. 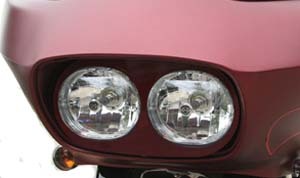 Headlamp (P/N 2249). 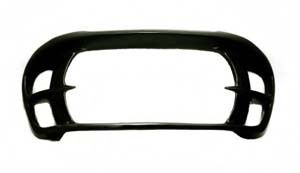 Injection molded ABS ensures durability and perfect fit. 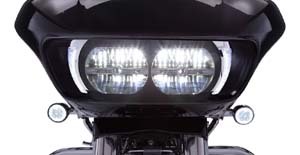 HRGS-15: Clean up the look of the new 2015 Road Glide. Our "Invisible" Fairing Support kit allows for the removal of the outer OE vertical supports that mount to the engine guard. 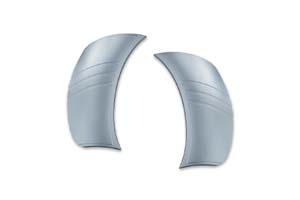 By doing this, the engine guard is easily removed or replaced with aftermarket versions. Complete set includes left and right side in black powder-coat finish and easy to use instructions. Do it yourself in no time! 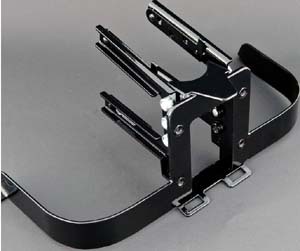 HRGB-1: Hidden Road Glide bracket. This gives you a clean alternative to the existing Harley support. Rigid 3 piece design provides plenty of support and rigidity. 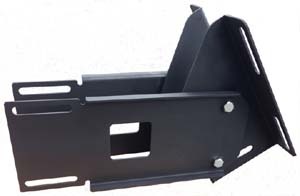 Non obtrusive, clean alternative to the stock bracket. Fits inbetween the inner and outer fairings bolting into the stock locations. 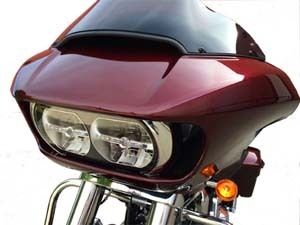 Made of 120 wall tubing, our bracket provides a rigid support while giving you a clean custom look to a stock or raked Road Glide. 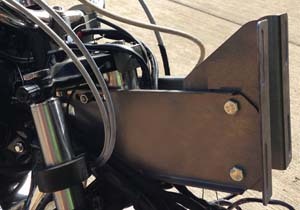 AFM-MC: New Adjustable Fairing Mount for Road Glides. Dramatically increase your field of vision by lowering your fairing, while achieving a more "custom" look by varying yoru bike's silhouette. Bolts on fully in about 40 minutes -- no drilling or extra hardware required, which means no damage to stock parts. 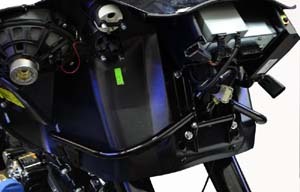 Six bolts allow easy adjustment of height without removing the fairing, or separating inner fairing from outer one. 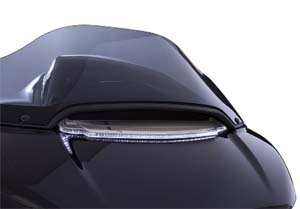 Unique wing-like structure provides your fairing all the suppport it needs, so you can remove your front engine guards if desired. 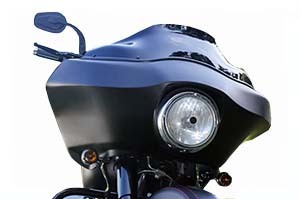 Allows you to lower the Road Glide fairing up to 2″ by increments of 0.5″ from stock position and makes it possible to remove the brackets from engine guard. Lower fairings will interfere with proper function of this fairing mount. Consists of high-quality steel with black powder coat. US and International Patent Pending. Free worldwide shipping by FedEx will be offered. This product allows you to lower the Road Glide fairing up to 3″ by increments of 0.5″ from stock position and makes it possible to remove the brackets from engine guard. 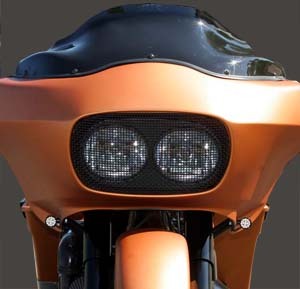 HFFM: New Adjustable Fairing Mount allows you to mount and adjust your Road Glide fairing to suit your needs. No more cutting and welding the OE mount or making one from scratch. Finished: Gloss black powder coat or raw steel. You'll quickly and easily get your fairing where you want it. 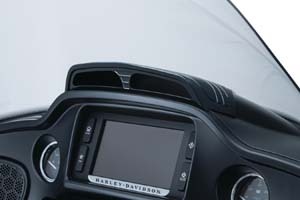 H-1: Custom Hood For Your Harley-Davidson 6.5 Boom!TM Box Infotainment system . Helps cut down on that annoying glare you receive on your Screen while trying to navigate. The Hood is constructed of High impact Textured ABS and a liner on the underside of the Hood to help absorb light. All made to with stand the outdoor elements of Motorcycle life. 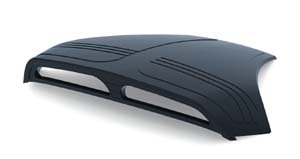 The Hood is attached at two points by the use of commercial grade weather Proof 2 sided tape.